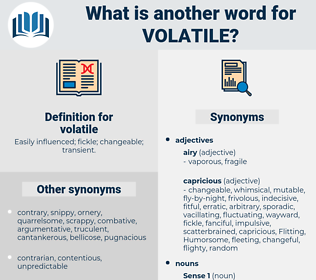 What is another word for volatile? Easily influenced; fickle; changeable; transient. destabilizing, fickle, versatile, labile, variable, delicate, unforeseeable, disturbed, per-session, fleeting, explosives, hair-trigger, insecure, strained, unreliable, cursory, irregular, ever-shifting, restless, ever-changing, chaotic, unsustainable, inconsistent, brittle, troublesome, heated, jittery, dangerous, airborne. explosive, fragile, precarious, unpredictable, troubled, turbulent, fluctuating, tumultuous, combustible, unsettled, erratic, shaky, uncertain, unsteady, disordered, tense, sensitive, tenuous, stable, fluid, choppy, ephemeral, vulnerable, inflammable. difficult, dependable, stable, steady, definite, constant, certain, enduring, calm, reliable, sure, firm, lasting, steadfast, permanent. 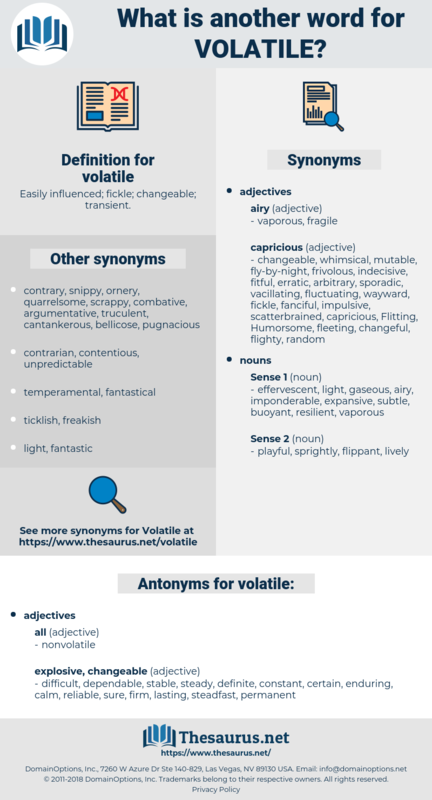 nonvolatilisable, trustworthy, even, predictable, unvarying, unchangeable, true, abiding, trusty, tried and true, immutable, durable, persistent, changeless, nonvolatilizable, invariable, uniform, tried, stationary, unchanging, equable. Joseph is naturally self - willed, and little Susan volatile. It was, indeed, exceedingly improbable that Miss Jessup had any agency in this affair, - a volatile, giddy, thoughtless character, who betrayed her purposes on all occasions, from a natural incapacity to keep a secret.